Rhizomes deeply set, 1-3 cm thick. Stems erect to arching, 5-20 dm; sheathing bract usually absent. Leaves sessile to clasping, (5-)9-20(-25) × 3-9(-13) cm; blade narrowly lanceolate to broadly elliptic, glabrous; prominent veins 1-19. Inflorescences in most leaf axils except distal 2-3 and proximal 2-7; peduncle flattened, not strongly reflexed, axillary 2-10(-15)-flowered, 6-9 cm in fruit. Flowers: perianth whitish to greenish yellow, tube (13-)17-22 mm, distinct tips gently spreading, 4-6.5 mm; stamens inserted near middle of perianth tube; filaments glabrous, sometimes minutely warty; pedicel 1-4 cm in fruit. Berries 8-12 mm. 2n = 20, 40. Flowering early--late spring. Dry to moist deciduous woods, in sandy soil, roadsides, railway embankments, old fields; 0--3000 m; Man., Ont., Que., Sask. ; Ala., Ariz., Ark., Conn., Del., D.C., Fla., Ga., Ill., Ind., Iowa, Kans., Ky., La., Maine, Md., Mass., Mich., Minn., Miss., Mo., Nebr., N.H., N.J., N.Mex., N.Y., N.C., N.Dak., Ohio, Okla., Pa., R.I., S.C., S.Dak., Tenn., Tex., Vt., Va., W.Va., Wis., Wyo. ; ne Mexico. As a polyploid complex, Polygonatum biflorum is variable as to plant size, flower number, and ecology. Tetraploids, which have been recognized as var. commutatum, are usually larger and coarser than diploids, var. biflorum, with more flowers per peduncle and more major veins per leaf. They have also been called P. commutatum, P. giganteum, and P. canaliculatum (Mühlenberg) Pursh (misapplied). Some diploids, however, are fully as large as any tetraploids. Range-wide separation of species has been problematic (R. P. Ownbey 1944; E. G. Voss 1972-1985; J. A. Steyermark 1963; G. Yatskievych 1999+), while local distinction may be possible (M. L. Fernald 1944b; M. W. Richardson and D. Ugent 1974). Detailed molecular and enzymatic analysis at the population level is needed range-wide, in conjunction with karyological and morphological study. Local populations of Polygonatum biflorum with honey-yellow flowers from southeastern Michigan and adjacent Ontario (E. G. Voss 1972-1985; R. P. Ownbey 1944) have been recognized as var. melleum. Disjunct populations in the trans-Pecos Texas and the mountains of Arizona and New Mexico have been called P. cobrense. 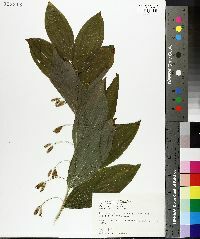 This species complex is found throughout the state: the tall plants with wide leaves usually along roadsides and fences and in open places in general except in cultivated fields; the small plants with narrow leaves are generally found in moist woodland. The fleshy, insipid fruit is eaten by birds and the stony seeds are widely distributed. The wide leaf form is of a somewhat weedy nature. The rhizomes are deep in the ground and if the terminal end is broken off the plant persists. For this reason it is difficult to eradicate from flower beds. My study of this species complex was made from 155 specimens which I have collected from all parts of the state. I am not satisfied with the treatment of this species but I am not able to find differences sufficient to distinctly separate them. My specimens form a lineal series and when I have used the term wide-leaf and narrow-leaf forms it is in a general sense. I do not think they are all the same species and I think a character may sometime be found that will separate them satisfactorily. The genus has been monographed by three authors and my specimens have been seen by one of them but I can not accept their treatment of this complex. Since the preceding was written a monographic study of the genus has been undertaken by Miss Ruth E. Peck who has studied all my specimens. I now learn that this complex is composed of at least Polygonatum biflorum (Walt.) Ell. and Polygonatum canaliculatum (Muhl.) Pursh. I refer students of this complex to the forthcoming monograph. A form of this species from St. Joseph County was described by McGivney (Amer. Midland Nat. 9: 662-664. 1925.) under the name of Polygonatum commutatum f. ramosum McGivney. It differs from the species by having short branches in the leaf axils and is our only report of this form. Perennial herb with a knotty, creeping rhizome 0.5 - 2 m tall Stem: arching or upright. Leaves: alternate, two-ranked, stalkless, often clasping, 5 - 20 cm long, 1 - 9 cm wide, narrowly lance-shaped to broadly oval, parallel-veined. Flowers: white to greenish yellow, 1.5 - 2.2 cm long, tubular, with six short lobes. Stamens six. Fruit: a berry, dark blue to black, 8 - 12 mm long. Inflorescences: are short clusters (racemes) of two to ten flowers hanging from the leaf axils. Similar species: The similar Polygonatum pubescens differs by having hairy veins on the leaf undersides. Habitat and ecology: Very common in a variety of habitats, including woodlands, along roadsides, and in thickets. 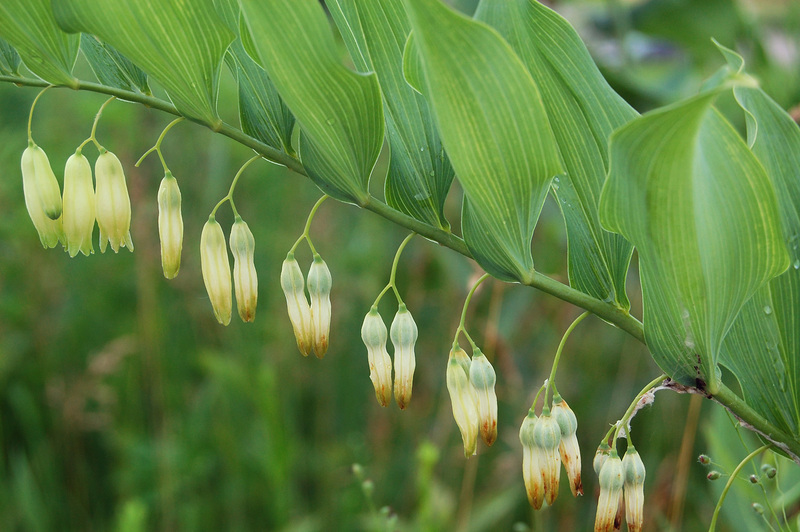 Etymology: Polygonatum comes from the Greek words polys, meaning many, and gonu, meaning knee-joint, in reference to the many joints of the rhizomes. Biflorum means "with two flowers." Stem slender or stout, 4-12(-25) dm, arching or erect; cauline bract foliaceous, persistent; lvs sessile and often clasping, lance-elliptic to broadly oval, 5-15 נ1-8 cm, glabrous, paler and glaucous beneath, with 7-19 prominent veins; peduncles slender or flattened, arcuate, not strongly deflexed, 1-15-fld; pedicels usually shorter than the peduncle; fls 14-22 mm, mostly greenish-white or yellowish-green; filaments mostly glabrous or minutely roughened; 2n=20, 40. Moist woods, thickets, and roadsides; Mass. and s. N.H. to Minn., Man., and N.D., s. to Fla. and n. Mex. May- July. Tetraploids are usually larger and coarser than diploids, with more numerous fls on each peduncle and more numerous, stronger veins in the lvs, and have been called P. commutatum (P. canaliculatum, misapplied), but some diploids are as large as any tetraploid. A few plants from se. Mich. and adj. Ont. with honey- yellow fls and ±hairy filaments have been called var. melleum (Farw.) R. P. Ownbey.